A cenote is a deep, water-filled sinkhole in limestone that is created when the roof of an underground cavern collapses. This creates a natural pool which is then filled by rain and water flowing from underground rivers. The word cenote comes from the Mayan word dzonot, which means "well." Some cenotes are vertical, water-filled shafts, while others are caves that contain pools and underwater passageways in their interior. Cenotes tend to have very clear, cool, fresh water. Cenotes are prevalent in the Yucatan Peninsula where the ground is primarily made up of limestone, and there are thousands of cenotes and underground rivers there; they are the area's main source of water. 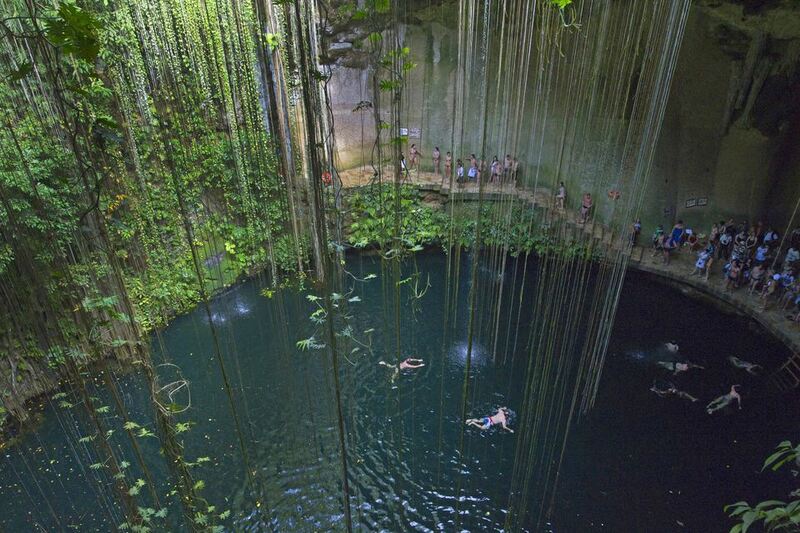 These sinkholes played an important role in Mayan cosmogony, and nowadays are a big draw for tourists who come to swim and dive and explore these refreshing natural swimming holes. Cenotes were ritually significant to the ancient Maya because they were considered passages to the underworld. Many cenotes, including the Sacred Cenote at Chichen Itza and the cenote at Dzibilchaltún, were used for sacrificial purposes: human and animal skeletons, as well as sacrificial objects of gold, jade, pottery, and incense, have been dredged from them. On a hot day in the Yucatan, there's nothing better than taking a refreshing dip in a cenote. Some of them are easy to access, with steps leading down to the water, and others are a bit more tricky, with ladders. In either case, take care when descending to a cenote because the steps can be slippery. Since the water filling the cenotes is rainwater that has filtered through the ground, it usually has few suspended particles, so the water is extremely clear, making for excellent visibility. They're a delight to snorkel or dive in. If you visit the Yucatan Peninsula, you may have the opportunity to be blessed by a Maya shaman before entering the cenote. This is a way of showing respect for the significance of the cenotes to the Mayan culture. The shaman or healer will burn some incense and say a few words in Mayan, to bless you and cleanse you of any negative energy before entering the cenote. That will take care of your spiritual cleanliness, but it's also a good idea to keep in mind what you're bringing into the cenote on your body - try to eschew chemical sunscreens and insect repellent as it may contaminate the water and it's not favorable to the natural life of the cenote. Instead opt for biodegradable, environmentally-friendly options. With its convenient location on the road between Tulum and Cobá archaeological sites, the Gran Cenote makes for a perfect stop between hot walks around the ancient Maya ruins. Known as Sac Aktun in Mayan, this cenote has crystal-clear water with a depth of around thirty feet. There are accessible caverns (which are a little deeper) that are home to small fish and some fascinating formations. The cenote is surrounded by jungle and gardens. The Gran Cenote attracts both snorkelers and divers, who come to explore the caverns or just cool off in the beautiful crystal-clear water. A shallow, sandy-bottomed snorkeling area near the stairs leading down to the cenote is the perfect spot for beginners to explore the underwater world, while more experienced swimmers and divers venture into the large cave, which is hung with stalactites. Dos Ojos (meaning “two eyes” in Spanish) is the world’s third-largest underwater cave system, and a must-see for divers and snorkelers wanting to explore this fascinating world. It also contains the deepest passage in the state of Quintana Roo, an almost 400-foot deep hollow called “The Cenote Pit.” The name Dos Ojos refers to the two neighboring cenotes connected by a large cavern, said to resemble a pair of eyes marking the entrance to the underworld. There is a safe, family-friendly part of the cenote that is perfect for snorkeling, with access in and out of the water from large wooden decks. Cavern diving is the most popular activity here though: the cave system is so vast and the underwater sights so extraordinary that many divers make this their must-do stop in the region. Along with incredible stalactite and stalagmite formations, you’ll see bats (there’s an actual bat cave), small fish and a type of freshwater shrimp in the beautifully clear fresh water. It's located just off Highway 307 between the towns of Akumal and Tulum. Popular with both locals and visitors looking for a well-situated, easily accessible and beautiful swimming spot. The cenote is one of three close by (the other two are called Cenote Azul and EL Jardin de Eden). All are part of the Ponderosa cave system. The setting is picturesque, with mangroves and jungle surrounding. While most visitors use the cenote primarily for swimming – it’s especially well-frequented by locals, who gather with their families on sweltering days – it’s also possible for divers to explore the cave here, which links Cristalino with Azul. Given its relative obscurity, Cristalino is a good uncrowded dive spot, featuring an overhanging ledge and a beautiful cave beneath. Out in the open, there’s also a ledge with a ladder from which swimmers can dive or jump into the clear water below. Cenote Cristalino is located just off the main Highway 307, south of Playa del Carmen. This cenote, also known as the Blue Cenote, is a very picturesque swimming spot located near Chichen Itza on the highway to Valladolid. Many visitors to the archaeological site make a stop here to cool off before heading back to their hotel, so it can get very crowded, especially between 1 and 4 pm. The cenote is open to the sky and the water level is about 85 feet below ground level, with a carved stairway leading down to a swimming platform. If you want to skip the steps, you can jump off the 15-20 foot wall. In Mexico, what is a Zócalo and why is it called that?